As you know yesterday we brought you the details of the IHG Rewards Club buy points flash sale. The offer is straight 100% bonus on whatever points you buy until the end of today and this post will show you have you can use this bonus to your advantage to save you some money on your stays! 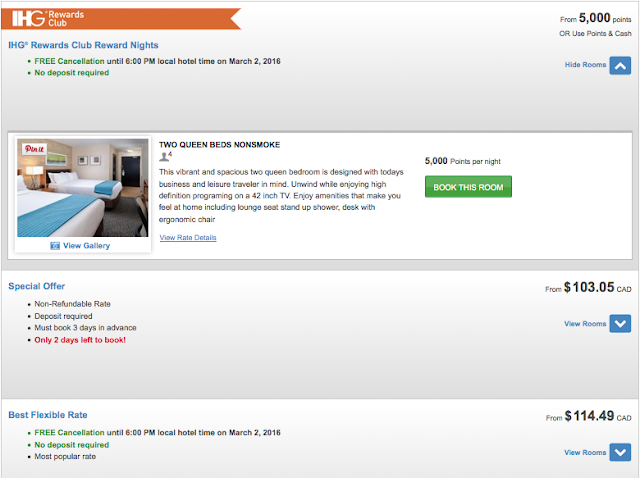 Now if you don't have any points in your IHG account you could buy 6,000 points with the current bonus (3,000 + 3,000) for US $40.50 and have 1,000 points leftover. Convert that to Canadian dollars and add GST and you are looking around $56 for that same stay. Saving you nearly $50 of the non-refundable rate! Need to stay 2 nights? It get's even better as 10,000 points is just over $94 for what would be over $200 if you paid cash for the stay bringing your savings to over $100. You can bring that price down even more if you buy over 26,000 points at once, effectively making any 5,000 point redemption about C$40. To buy 60,000 points with the bonus is US$345.00. 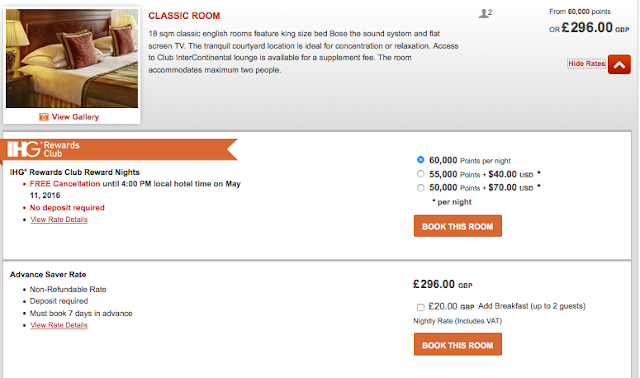 Convert that to Canadian and add GST and you are looking at about C$500 versus the approx C$555.70 for the non-refundable rate for a savings of almost $55 on that one night! Even bigger savings are achieved if you compare apples to apples and look at the Best Flexible rate of 369GBP as that rate can be cancelled like the reward night can. Overall the 100% bonus on buying IHG Rewards Club points can provide great value! The offer brings the price of a point down to 0.575 of a U.S. cent if you buy over 26,000 points. This per point price is less than the Points+Cash trick of buying points for 0.7 cents. If you choose to buy the maximum number of points, 60,000, it will cost you US$690 but of course you'll end up getting 120,000 points. That's 24 nights at IHG hotels if redeeming via the PointBreaks option which works out to only US$28.75 per night! YOU HAVE TO BUY POINTS BY TONIGHT BUT YOU DON'T HAVE TO USE THEM RIGHT AWAY. However we do recommend that you don't buy points if you don't think you'll use them in the next 3-4 months are you always run the risk of the program raising redemption rates for stays.